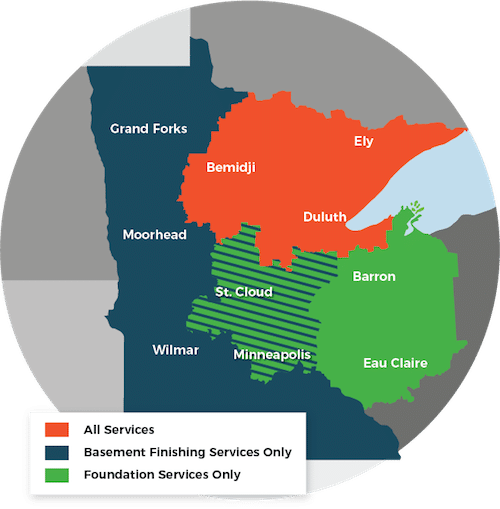 DBS of Minnesota and Wisconsin is your local Supportworks contractor, providing services to Grand Rapids, Eveleth, Hibbing, Proctor, Hayward, Bemidji, Eau Claire and areas nearby. We specialize in new construction foundation supports and foundation repairs of all types. If you have questions about product availability, pricing, or technical information, contact us today to speak with a foundation repair contractor. What is the Supportworks Network? Supportworks Inc. has an excellent standing with the Better Business Bureau and is committed to customer satisfaction. Supportworks is an international network of the most knowledgeable and experienced foundation repair contractors throughout North America. With independently owned and operated dealerships spanning from coast to coast, Supportworks works together with each of its dealerships to research and implement the best foundation solutions in the industry. Supportworks focuses on professional training, industry research, and sharing the best practices in the industry. With this in mind, DBS of Minnesota and Wisconsin operates with the resources of literally hundreds of years of combined experience! Engineered for Performance – Supportworks maintains a staff of both geotechnical and structural engineers. These experts assist in product design, dealer support, and quality assurance of all Supportworks products. Supportworks dealers operate with long-term goals in mind, and they care about quality customer service. What This Means for You: You can rest assured that you will get a quality, safe, secure solution to your foundation. Bowing and leaning of basement walls. Settling of heavy structures such as large homes, offices and apartment buildings. Settling of light structures such as decks, stoops and porches. Settling columns in crawl spaces. When it comes to stabilizing your foundation, don't settle for less than the industry-leading products provided by Supportworks! Our foundation repair contractors will not only recommend the right solution to your problem, but will also provide service that is unparalleled in the industry. Supportworks has major foundation repair dealer support facilities in Omaha, Nebraska and Seymour, Connecticut. Supportworks employs only the most qualified geotechnical and structural engineers for product design and quality assurance of their foundation products. Their engineers also provide ongoing support to their dealers by providing guidance and information regarding product capacity or design as well as any job-specific questions that may arise. This means that each of our contractors has the support and collected knowledge of an international network of contractors, ranging from coast to coast all across North America! Many Supportworks' steel products are galvanized, further ensuring durability and a long lifespan. Supportworks places a strong emphasis on training. Dealership owners and employees are provided continuing training opportunities. Trainings include not just product installation methods but also courses on customer service and management, as well as a full library of extensive video and audio materials. All Supportworks products are manufactured with the utmost in quality and safety in mind; each stage of the manufacturing process is carefully monitored. As members of this international network, you can rest assured that they benefit from a first-class organization -- one that keeps all its contractors on the cutting edge for quality, professionalism, and customer service.